BRIGHT TRADE SHOW GOES BERLIN 08.07. - 10.07.2010! You can find us at booth 217 and get a preview on Carhartt’s Spring / Summer 2011 collection. Meet our sales representatives, have a chat with our people from the marketing department and enjoy the tenderly set up photo exhibition connected to the movie In Search of the Miraculous by Pontus Alv and Nils Svensson. 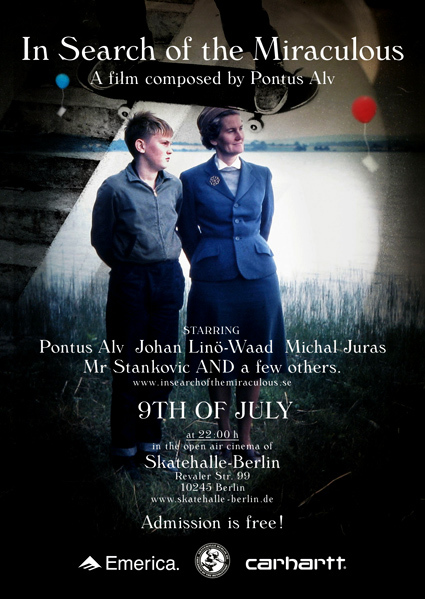 The historical building also includes an impressive movie theatre, where Pontus Alv’s second full-length movie, In Search of the Miraculous, will be screened on Thursday, 8th July at 4pm, Friday 9th of July at 2pm and Saturday 10th of July at 11am. If you don’t make it there you’ll get another chance to see this masterpiece on Friday, 9th July: Carhartt will present the Berlin premiere of In Search of the Miraculous at the Skatehalle Berlin, Revaler Strasse 99. The screening starts 10pm and there is free entry. We suggest to arrive early to ensure you get a seat.